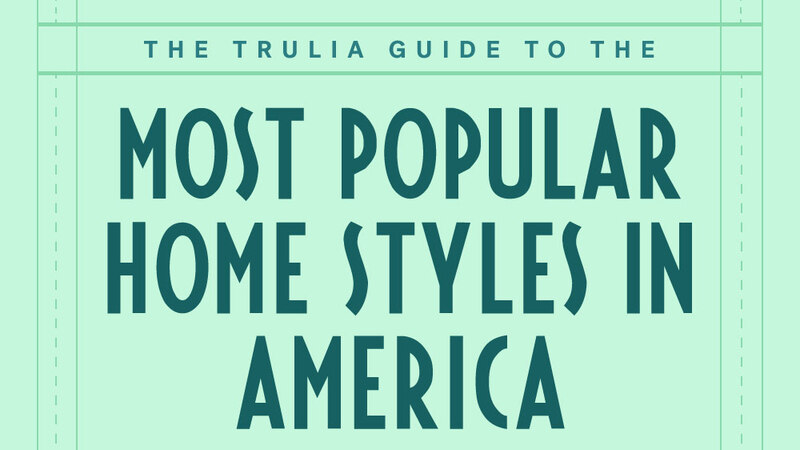 Trulia combed through the data to find out which home styles Americans love the most. Think you know what style of home your state loves best? Here are some hard facts to back you up. Trulia scoured the listing data of for-sale homes in more than 100 metros to find out how homes are most often described in each state. Hunting for more than a dozen home styles, including craftsman, Victorian, Tudor, modern, adobe, cottage, and more, we tallied the listings to find each state’s favorite style. Do you live in a state that loves the humble ranch or favors a different home style? Find out below! 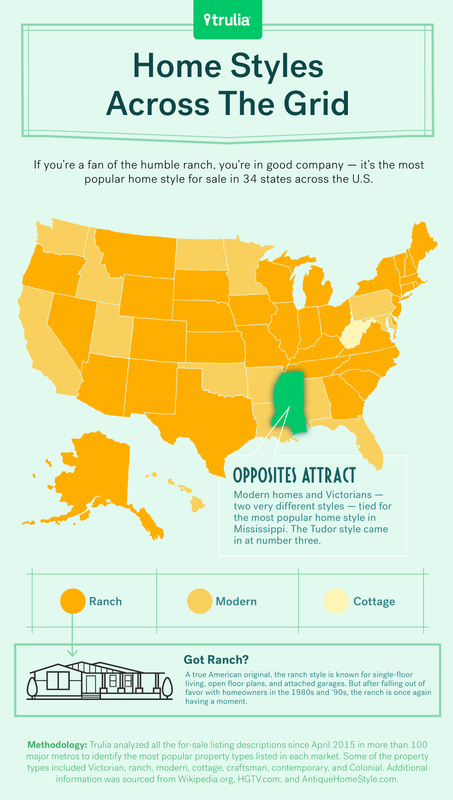 While you might not be surprised to learn that ranch homes are the national favorite, with 34 states claiming them as most popular, you may not have expected them to beat out the second-favorite style by more than double (modern homes are most popular in only 15 states). 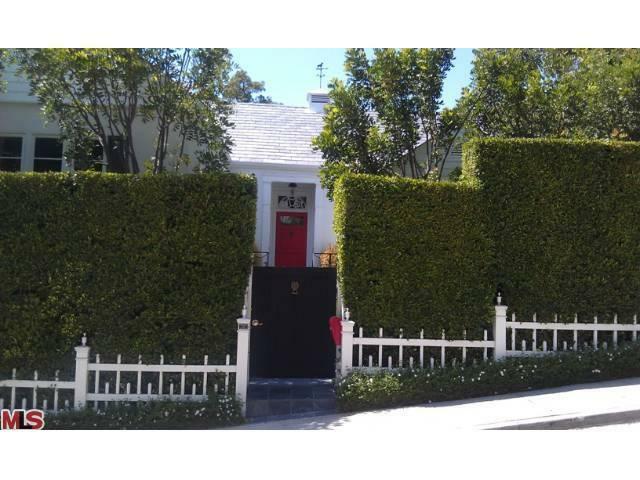 Americans love single-story living! That popularity could be due to affordability. For instance, while ranch homes rank high for popularity in Georgia, in the state’s largest city, they also get a boost for affordability. Ranch homes for sale in Atlanta, GA, have a median listing price of $92 per square foot, almost half of the citywide median listing price of $180 per square foot. This trend seems to hold true in some other metros across the country: In Portland, OR, the median listing price of ranch homes (also the state’s most popular home style) is $186 per square foot, which is just 75% of the city’s median listing price of $248 per square foot. But it’s not the full picture: Popularity doesn’t always equal affordability. Consider Seattle, WA, where craftsman homes for sale rank second in popularity, with a median listing price of $250 per square foot, while the citywide median listing price is much higher, at $397 per square foot. Meanwhile, in Milwaukee, WI, where the citywide median listing price is $91 per square foot, ranch homes — the most popular home style in the state — come in at $129 per square foot, followed by $140 per square foot for the second-most popular home style, modern. Modern homes have a reputation for being pricier than other styles, but if you love modern homes, take heart: they aren’t always more expensive. 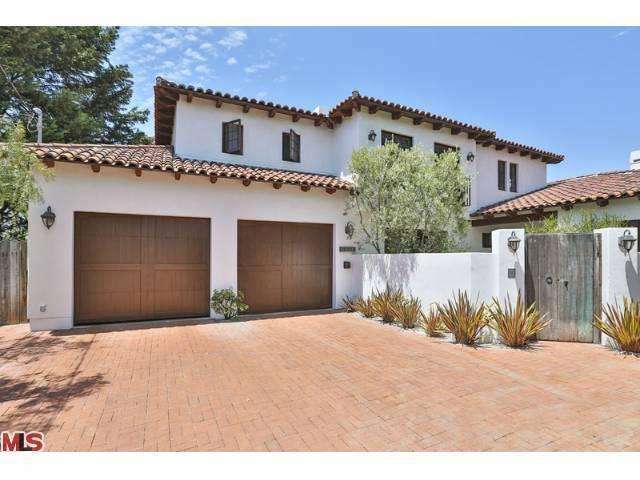 For example, while modern homes reign supreme in California, prices don’t always follow suit. The median listing price of modern homes for sale in Oakland, CA, is $437 per square foot, not a large jump from the median listing price of all homes in the city, $432 per square foot. 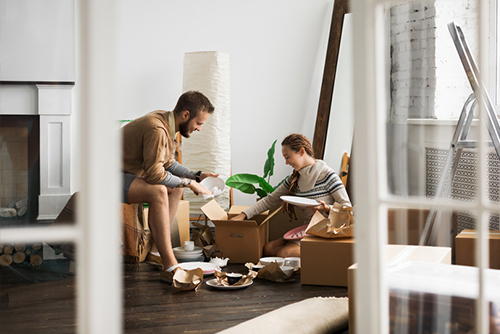 But across the bay in San Francisco, CA, a modern home will set you back $833 per square foot — a flat-out bargain when you consider that the median listing price citywide is a whopping $940 per square foot. In most states, only three styles — ranch, modern, and contemporary — rank as most popular, with the others falling in line at percentage points well below 1% each. 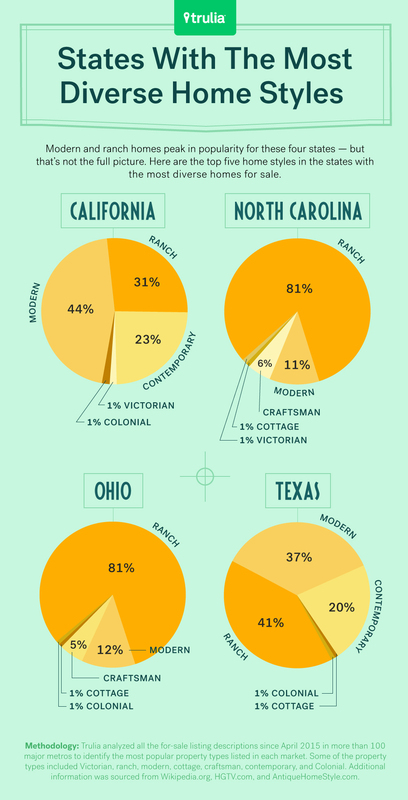 But in some states, like the four in these pie charts, there is more diversity in home styles. These aren’t the only states where more diverse home styles are popular, however. In Maryland, for example, farmhouses come in at number four in popularity (but account for only a tiny sliver of the listings at much less than 1%), and in the South, states tend to have more diverse for-sale offerings: In Louisiana, North Carolina, South Carolina, Tennessee, Texas, and Virginia, the most popular home styles include cottage, Colonial, craftsman, Victorian, and Tudor, none of which appear on any state lists in the Northeast. What’s your favorite home style? Does it match your state? Share in the comments below! These homes offer romantic charm without cracking your nest egg. 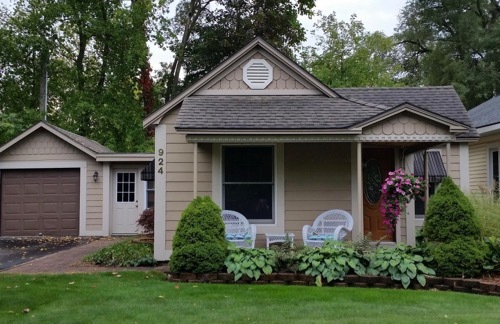 One couple's story of how being "casual" house hunters turned into a very serious purchase.